Hello Gorgeous: Just Say Gno. I want to love them, but when it comes right down to placing something in the garden, I go for a rusty urn or architectural fragment every time. How was your Christmas HG?! I had a lovely Christmas, David, thanks. I, however, feel no pressure to love gnomes. None. The one pictured here is cuter than most I have to say. How about using it your headline when spring has sprung! I know, I jumped the gun but it was etsy's fault. I received an email alerting me to these and I couldn't contain myself. 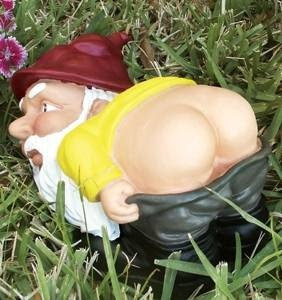 Made me laugh - my brother has a thing for gnomes. So glad you are enjoying your print! Happy New Year! Meanwhile, I feel a certain kinship with the gnomes, being as I am small and occasionally sprightly. Also, I have been known to wear funny hats and pass out drunkenly on front lawns with my pants around my knees. Anne - I know they're popular. Only crazy people used to have them in their gardens. Ha. Erin - I got nothing. That cracked me up.